The new RS 5 Coupé, which Audi says combines elegant aesthetics with everyday usability, has a starting price from €110,750 on-the-road. 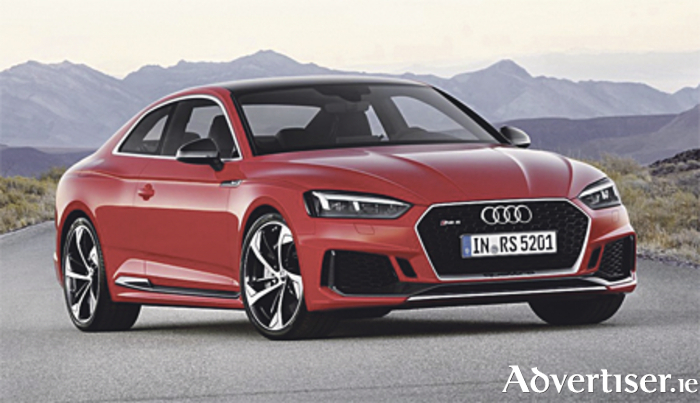 The new Audi RS 5 Coupé represents the gran turismo of the RS models from Audi Sport, with a 2.9 TFSI V6 bi-turbo engine which it claims has been engineered to provide superior performance and higher efficiency. Audi says that it offers sharper acceleration with that unrivalled full-bodied RS sound. It delivers 450hp and a peak torque of 600Nm more than its predecessor. As the top model in the A5 family, the RS 5 Coupé sprints from zero to 100km/h in 3.9 seconds and reaches an impressive top speed of 250km/h, with an optional upgrade to 280km/h. The dual turbochargers of the 2.9 TFSI unit are centrally positioned inside the V of the engine, each supplying a single cylinder bank, resulting in claimed sporty, direct responsiveness. The quattro permanent all-wheel drive is a unique selling point in the segment. With its dynamic set-up, Audi says it makes a great contribution to the sporty yet stable handling of the new RS 5 Coupé. The German carmaker claims that the optional Sport differential, with RS-specific tuning, ensures an even more dynamic response when turning corners and accelerating. It distributes the torque actively and in a targeted manner between the rear wheels, improving the car’s overall agility, precision and stability. The all-new Audi RS 5 Coupé combines an athletic, sporty look with a contemporary, classic and elegant design. Its new lightweight structure weighs in at only 1,655 kg - 60 kg less than its predecessor. The singleframe radiator grille is much wider and flatter than in the standard model and comes with 19-inch forged aluminium wheels. The sporty look and feel of the car continues through its RS-specific diffuser insert, oval tailpipes of the RS exhaust system and a surface-mounted spoiler lip. The new RS 5 Coupé is 74mm longer than the previous model. The RS 5 Coupé boasts a number of technology improvements, which now come as standard, including MMI Navigation Plus, Smartphone Interface, and a three-year subscription to Audi Connect. This connects the new RS 5 Coupé to the internet using LTE technology. Passengers can browse the internet with their mobile devices via the Wi-Fi hotspot option. Special RS displays in the Audi virtual cockpit provide information on tyre pressure, torque, and g-forces. RS sport seats and the flat-bottomed RS multifunction sport leather steering wheel accentuate the sporty character of this high-performance Coupé. The new Audi RS 5 Coupé will be available to order from this September. Contact one of the Audi team at Michael Moore Car Sales on (090 ) 6403900 for more details. Is there a ‘Leading Light’ in your community? Page generated in 0.0820 seconds.